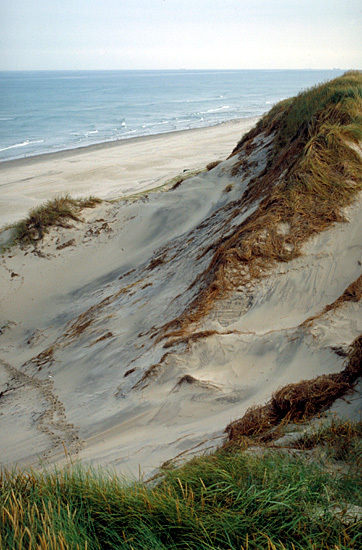 Most of the western coast of Jutland and the islands in The Wadden Sea are bordered by sand dunes. The picture shows the the mobile dunes, which is white and lies close to the North Sea. The sand dunes are very sensitive for tourisme. A destruction of the vegetation can result in a massive wind erosion resulting in the sand beeing blown as dust storms a long way further in over arable land. Up to around 1900 the dune areas was grazed especially by sheep. This over-exploitation has resulted in large sandstorms, that covered large areas in the middle ogf Jutland and destroyed the farmland. These inland dunes are today mostly covered with plantations of conifers or different kinds of heath vegetation. In recent times the wind erosion of the coastal dunes has been much deminished by planting of grasses or placing different kind of material on the sand.